I’m a sucker for beautiful harmonies. Meaningful lyrics. And local singer/songwriters who should be international stars, but for whatever reason never move beyond a too-small circle of loving, devoted fans. In the 1970s it was Carlson & Gailmor — Rob and Jon, the Staples High School graduates whose “Peaceable Kingdom” album is one I’d still run into a burning building to save, but who Polydor Records never knew how to promote. They’ve both moved on to long, separate musical careers. But they should have reached a worldwide audience. For well over a decade, it’s been the Wiggins Sisters. Like Carlson & Gailmor, their music is so much better than so much of the garbage that is (and was) out there. It’s astonishing too few people know (and love) them. Unlike duos like the Righteous Brothers, Mizzy and Casey Wiggins are actual siblings. They learned to sing harmonies from their dad, on family road trips throughout their native Midwest. Their influences range from Bob Dylan and Joni Mitchell to Motown and the Rolling Stones. There are strong strains of Bonnie Raitt, Lucinda Williams, the Avett Brothers, Emmy Lou Harris and Linda Ronstadt too. In the 1980s, the sisters pursued separate careers. Casey attended the Musicians Institute and performed in Los Angeles. Mizzy went to the University of Texas, immersing herself in the Austin music scene. In 1993 Casey and her husband Chuck moved to Westport. They embarked on a business venture with singers’ brother Steve — founder of Oxford Health Plans. When Mizzy and her sons came to Wilton the next year, the sisters quickly picked up where they’d left off — singing and writing — as teenagers. They were part of the folk revival of the ’90s, performing at song swaps in Greenwich Village and on the Northeast coffeehouse circuit. The Wiggins Sisters, in the studio. Westport has always supported their music. Bob Hertzel gave them an early gig, at the Westport Arts Festival. They played at many First Nights, and the Levitt Pavilion — one of their favorite venues. Their second album, “Minnesota,” was produced by Lloyd Maines, of Dixie Chicks fame. It received widespread praise, and radio airplay. 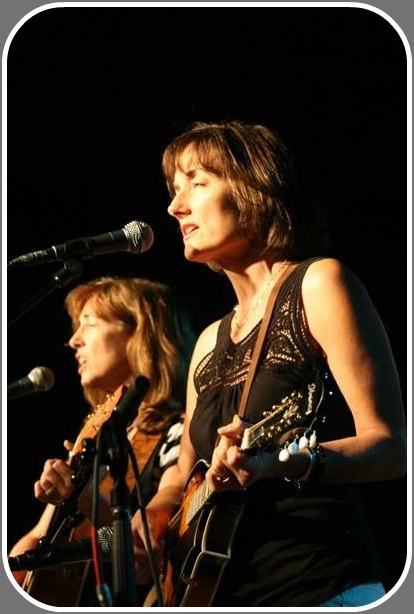 Both albums feature actual songs — not “tunes.” The sisters write and sing of their lives in Minnesota and Texas; of growing up and moving away; of meeting old friends and lovers; of living lives in America today. The sisters traveled and performed extensively. But they never became, say, the Dixie Chicks. Meanwhile, each woman was raising 3 children. As they became teenagers — and Casey and Mizzy’s mom suffered a stroke in 2004 — the women pulled back from writing, recording and touring. Mizzy became a certified yoga instructor, and earned a doctor of nursing in philosophy degree. Casey tutored at Mercy Learning Center in Bridgeport, and is a board member of Positive Directions. But good music has a way of sticking around — and surprising. “Minnesota” won the Best Americana Album award at the Independent Music Awards in Nashville in 2009 — 10 years after its release. That motivated the sisters to go back in the studio. It was time to record the many songs that had piled up over the years. It took a while. Mizzy moved back to Austin in 2015, to be near her children and teach at her alma mater. Casey traveled to Texas several times. 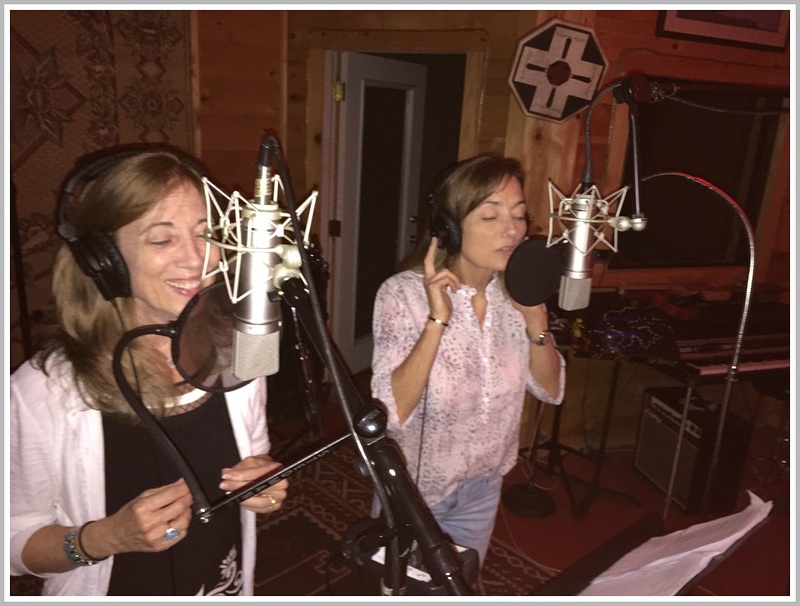 The sisters recorded 16 songs at the famed Zone Recording Studio, with ace Austin musicians. Twelve of those tracks — plus 2 from earlier demos — became their new album. Like previous efforts, the songs range from Appalachian-style ballads to blues, from country to folk to rock, from tender to tough. It’s called “Fairfield County.” The title track was written by Mizzy about leaving this area, and ending a chapter in life. Mizzy and her husband Jeff moved again, to Rhinebeck, New York. The Wiggins’ father, Tony — their musical mentor — died in June. He had lived for many years in Wilton. “Fairfield County” caught the ear of WFUV DJ John Platt, who invited them to his “Sunday Supper” radio program. The women were also part of the station’s “On Your Radar” showcase at Rockwood Music Hall this month. 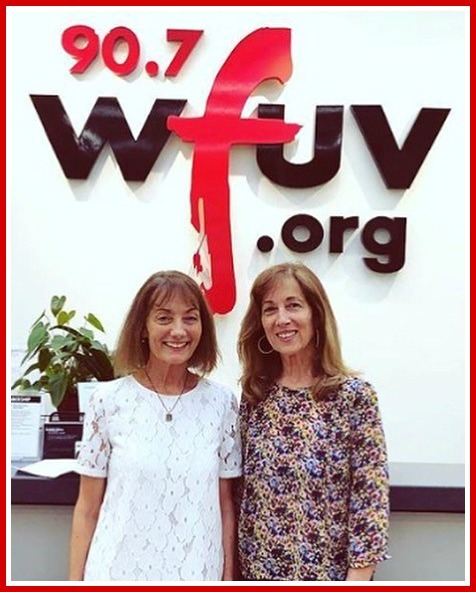 The Wiggins Sisters at WFUV-FM. The album is selling well. I think it deserves to sell really well — like, at Taylor Swift levels. But even though “Fairfield County” is not platinum, the Wiggins Sisters continue to do what they love. They’re already working on a follow-up. They sure do. And if you’re one of the too-many people who have not heard of the Wiggins Sisters, click here. Or go to iTunes, Spotify, Amazon or CD Baby. Whether you’re from Fairfield County, Minnesota, Texas — or anywhere else — these 2 women deserve to be heard. This entry was posted in Arts, Entertainment, People and tagged Casey Wiggins, Mizzy Wiggins, The Wiggins Sisters. Bookmark the permalink. So glad to read this post. It was a wonderful moment when I recently reconnected with Casey. I was interviewing her father for a “This Is Your Life” program at Meadow Ridge in Redding and Casey was there. She and her sister had been part of the Westport Arts Center Concerts when I was Production Manager under Eileen Wiseman. Great years, great times, great performers like the Wiggins Sisters. I said to Casey that we would love to have them back performing live. So thank you, Dan. I too am so happy to read this on 06880 so thank you! I heard the Wiggins Sisters several times shortly after moving to this area in the late ‘90s. Their songs are wonderful – Thoughtfully crafted and evocative. I’d wondered what happened to them so am thrilled to have such a great update. I hope to see them perform again soon and will check out their albums! These ladies are fantastic. My wife and I saw them twice several years ago performing at the Westport Arts Festival and immediately acquired both of their albums, which we still listen to. I agree they should be A-list celebrities with their harmonies and song-writing talent, but I’m guessing they’ve been unwilling to subordinate their lives in pursuit of this goal. This speaks well of them. Glad to hear they have a new album out, which I intend to acquire as soon I can find it. And there are few things I’d love better than to hear them perform locally again. The Wiggins Sisters are wonderful. I’m going to look for their music. As a current Texan, although I hardly ever admit it to locals, who proudly still claims her Connecticut Yankee heritage, I found the music wonderful. Two things that Texas has that Connecticut does not are huge vistas of the sky and the Texas Two Step dance. The Wiggins capture both in their song. I’m looking forward to hearing the rest of their music, especially Fairfield. I left my heart in Fairfield……. the rest of me currently lives in…well, you know from the post…..
Their vocal harmonies are very beautiful ! Thanks for this, Dan. I’ve had a Wiggins Sisters CD in my car for years. Don’t know how I happened to come to know them and buy it, but it’s a favorite. Some of the songs still bring me to tears. When I moved to Meadow Ridge I was delighted to meet their dad, Tony, who is sadly missed now. I met the sisters and told them that I wished they had more performances in the area – and HERE! Now I have a new CD to buy! I went to Bedford Junior High School with “Kate Wiggins.” Is she a relative? Just download and listened to this album. Happy to report the ladies have only gotten better!